Alfred Leslie is a pivotal American artist-painter-filmmaker whose work spans the past fifty years. A celebrated contemporary of the Abstract Expressionists and a key figure in the extraordinary social milieu of downtown New York from the 1950s and 60s toAlfred Leslie is a pivotal American artist-painter-filmmaker whose work spans the past fifty years. A celebrated contemporary of the Abstract Expressionists and a key figure in the extraordinary social milieu of downtown New York from the 1950s and 60s to the present, his own canvases were amongst the most revered of his peers. In 1964 he made Pull My Daisy with the photographer Robert Frank and in 1966 collaborated with the inimitable poet Frank O’Hara on The Last Clean Shirt. In 1960 he edited and published the amazing collection of texts and drawings that form the ‘one shot review’ The Hasty Papers – in and of itself a summation of cultural activity with contributions from Allen Ginsberg, John Ashbery and Fidel Castro amongst may others. Leslie dramatically moved away from abstraction to make giant almost hyper-real portraits, the majority of which were destroyed in the now infamous fire that ripped through his studio and its neighbouring blocks on October 17 1966. This utterly devastating event, that completely destroyed paintings, films and manuscripts, continues to inform his work today. 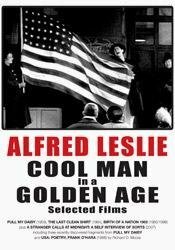 Cool Man in a Golden Age presents a selection of his key films on DVD for the first time alongside a new video ‘self-interview’ and a rare television documentary from 1966 featuring Frank O’Hara and Alfred Leslie as well as a new essay by Ian White.